Matt Lauer is a cheese-ball. Proof of his journalistic cheesiness can be found in the Dateline NBC special aired August 2009 entitled “A Dose Of Controversy.” It was supposed to be an in-depth look at the possible link between childhood vaccines and autism, with Matt Lauer promising “common sense” advice for parents of young children. 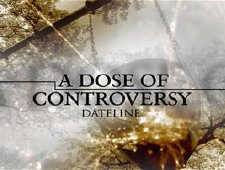 Instead the Dateline report focused on one vaccine, the MMR shot, and Dr. Andrew Wakefield, a British scientist who published a study questioning the safety of the MMR vaccine back in 1998. Wakefield’s nemesis is Paul Offit, head of infectious disease at Children’s Hospital in Philadelphia and author of the book Autism’s False Prophets, who claims Wakefield is spreading false science. Offit blames Wakefield for the falling vaccination rates in the UK and the United States. Both sides point fingers. So what’s the common sense advice for parents? Incredibly, Matt Lauer closes his piece by reading a press release from the American Academy of Pediatrics urging parents to vaccinate their children according to their advised schedule. Reading from a press release, Matt? Is this what passes for investigative journalism these days? Cheese-ball! As the parent of an autistic kid this type of “news” coverage infuriates me. I won’t lie to you – I do think vaccines played a role in my son’s autism. Maybe it wasn’t the mercury in the shots (my son was at the tail end of the thimerosol shots) and maybe it wasn’t the MMR vaccine (though my son was never “right” again after he got his) but maybe it was a combination of the 26 shots he received before he was 18 months old. My son was a tiny baby, born a couple of weeks early. Common sense tells you those are a lot of shots for a tiny immune system to process. Why so many shots? Good question. Matt Lauer should ask it. When my wife and I were new parents, we went to a pediatrician who followed the guidelines of the American Academy of Pediatrics to the letter. We did what Matt Lauer would have told us to do. And when our son was diagnosed with autism at 18 months old, we did what Paul Offit would have told us to do; we relied on the resources of conventional medicine. And frankly, those resources sucked. The developmental pediatrician who diagnosed our son handed us a bunch of old pamphlets that told us autism is incurable, and that 80-percent of autistic kids are retarded. We started working our way through the maze of Early Intervention services (militant-style behavior therapy with a mixed bag of therapists) and our school system. It wasn’t long before we realized that mainstream treatments for autism were weak; not enough hours, not enough trained therapists, not enough anything. Your pediatrician will happily write your child a prescription for Ritalin or Risperidone, however. Whether you agree with Andrew Wakefield’s theories or not, there are certain undeniable truths about this new generation of autistic kids. Get any ten of them in a room and eight will have some type of digestive problem: diarrhea, constipation, limited diet, etc. And once you start treating those “gut problems” many of these kids start getting better. That’s a fact. That’s news. That’s where the real story is. But you almost never see that story in the mainstream media. You don’t see big government-funded studies looking into the “gut-brain connection.” You don’t see reporters digging to find out what new autism treatments are working. Instead you get more “studies” declaring vaccines safe. You get Matt Lauer reading a press release. It makes me want to throw things at my television set. Because autism is a treatable disease, maybe even a curable one. Yes, the biomedical treatment of autism is a field rife with charlatans, the “false prophets” of Paul Offit’s book. (I could fill a book of my own with all of the snake oil salesmen my wife and I have encountered over the years.) But there are also a lot of good people – good doctors, good therapists, good scientists – out there developing valid new treatments for autistic kids. Not every treatment works for every child, but some do. That’s where doctors, scientists and journalists should focus their energies. Explore these new treatments, sift out the “false prophets” from the “real deals,” find out what’s working and – more importantly – why it’s working. Instead of trying to revoke Andrew Wakefield’s medical license, why not take a look at the research he and his colleagues are doing, and see what they’ve found? Instead of funding another “vaccines and autism” study, maybe the government should fund a study where 1,000 autistic kids get free meythl-B12 shots for a year. I’d bet that 60-80 percent of those kids would show improvements in language and social skills at the end of that study. Maybe Dateline NBC and Matt Lauer should follow 10 autistic children as they start on a gluten-free, casein-free diet and track their improvements, if any. Give the caregivers of autistic children some tangible information they can work with, not rhetoric and press releases. The vaccination timetable set by the American Academy of Pediatrics is like every other public health policy – it’s tailored to cover the lowest common denominator, the babies most at risk for diseases like hepatitis and diphtheria. If your baby lives in a tenement, or is tossed into a germy daycare environment at six weeks old, then maybe you’d feel safer following the AAP’s shot schedule. But if your baby is like many babies and pretty much sticks close to home for the first couple years of its life, then they probably don’t need all the shots the AAP recommends as early as they recommend them. I’m sure a pediatrician will write in to tell you differently. But common sense should tell you otherwise. Matt Lauer should have too. 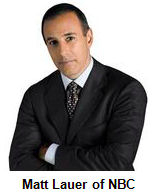 A fine example of Lauer’s lazy, hack reporting.